Having spent a wonderful weekend at Tewkesbury Medieval Festival and Battle, I thought I’d tell you all about it. Yes, I know that The Battle of Tewkesbury in 1471 is a bit in the future as far as this blog’s concerned, but the re-enactment, apart from being the largest in the UK, is also a fantastic event. It deserves as much support as it can get as it survives only on the money it makes from car parking, stallholders and donations. If it can’t make a profit, then it can’t be staged, and if it can’t be staged then there is a real possibility that developers will buy up the battle field and plaster new houses and supermarkets all over it (despite being in a flood plain!!!). Also, I know that several of you would have liked to have been there, so, as a poor substitute, here’s the write up and a few pics (spread over the next 3 posts because otherwise you’ll get photo-fatigue). I would like to say a big thank you to mum who took the photos (she had a shake proof camera – vital for taking pics over the heads of the crowd at times!). 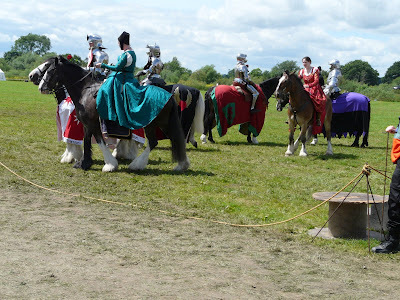 On both days, there was a joust, by the very entertaining and professional jousting group DESTRIER. Despite some microphone problems and a heavy shower on the Saturday, they performed like troopers. I dread to think how long it must have taken to dry some of the ladies’ dresses out (and here I speak from personal experience from when I did re-enactment!). On the Saturday, the group started out with some hunting games and horseback/weaponry skills – which the women joined in with as well. You’ll note from the pictures that the women are riding astride, not side-saddle as you might expect. This is not an anachronism: women did ride in this way through the middle ages, keeping their dignity by having skirts that covered both their legs and the rumps of their mounts. Side saddles were known – and used, especially after 1382 when Anne of Bohemia, Richard II’s wife made them fashionable – however, I’m sure that riding in that position must have been harder and more uncomfortable, especially when hunting. As the centuries progressed it became less and less acceptable for women to ride astride and by the 16th century it was thought improper for ladies to ride in any way other than side-saddle. The hunting games consisted of running at rings with a lance and trying to collect as many as possible, and also hitting a target with a javelin dart (the target being either an archery-type one or else a ‘boar’). However, the one I enjoyed most was the cabbages on sticks. Here the ‘hunters’ had to ride at the cabbages with a sword and chop them in half. Personally, I thought it was a very useful way of chopping up the veg for dinner later! The next part of the entertainment was the joust itself. For a history of the joust as well as lots of other information on the sport, have a look at Destrier’s two web sites (links at the bottom of the post). For the Tewkesbury joust, the knights were split into two teams – one representing the House of Lancaster and the other representing the House of York. One knight from each side then rode at each other down the line of the tilt barrier, hoping to deliver a good strike, preferably on the breast plate. Real wooden lances were used (although tipped with balsa wood so as not to cause serious injury) and the sight and sound of them splintering against metal was breathtaking. The crowd cheered for each side (Lancaster or York) when prompted, although in my opinion they could have been a bit more enthusiastic (perhaps it was the rain dampening spirits). At the end of all the individual passes, the two knights with the highest score were then chosen to partake in the ‘final’ in order to decide both the champion and the winning side. For those who are interested in armour (like me), here are some closer shots of two of the knights. As you can see, they really look the part. And just before the last shot of a knight on horseback, I’d also like to say how well-behaved the horses were (courtesy of Atkinson Action Horses) – even if one had a habit of turning his back to the tilt barrier just before he was about to make a pass! Considering all the distractions of the crowd, clanking armour, shouting and splintering lances, they were impeccable, and, most of all, wonderful to watch in action. I have seen a few jousts by other groups, but I have to say that Destrier’s enthusiastic and expert approach to this ancient art puts them head and shoulders above the rest. or even better – if you are in the UK and anywhere near one of their events, go and see for yourself! Tagged Destrier, re-enactment, Tewkesbury Medieval Festival. Bookmark the permalink. Great pix (especially the last one–yummy!). I wonder if it was common for ladies to wear some sort of breeches while riding astride? Margaret Wade Labarge notes that Eleanor de Montfort had what appears to have been some such garment made for her. Susan: I don’t really know that much about women’s riding gear unfortunately – I’ll have to look into it. I would have thought though that they must have had some type of undergarment under the dresses when riding otherwise it would be a little… errr… uncomfortable.